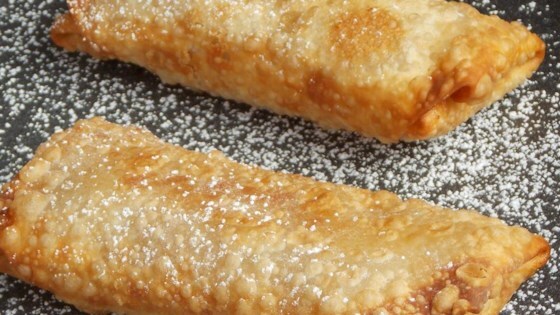 "A very simple dessert using egg roll wrappers. I made this up when I had two leftover wrappers after making egg rolls, and it worked out really well!" In a medium-size mixing bowl, toss together the apples, cinnamon and sugar. On a clean dry surface, lay out egg roll wrappers. Brush each one lightly with butter to within 1/2 inch of the sides. spread about 1/4 cup of the apple mixture onto the buttered area. Combine the cornstarch and water, brush top edge with the mixture. Fold the wrapper around the filling, and roll up to seal. Place onto the prepared cookie sheet, seam side down. Brush the tops with milk and sprinkle with sugar. Bake for 15 to 18 minutes in the preheated oven, until golden and crisp. I fried mine instead... They were great and easy as well. I sifted a little powdered sugar over them for a lil' cuteness...lol.thx. These are just okay. They are good when you want something sweet and you don't want to eat junk food. My daughter thought they were good, but she likes almost everything. Good, but too chewy and hard to bite when made in the oven. Definitely don't reheat well either. As written we didn't care for these. Filled with cooked apple slices and fried are great but baked with chopped apples just didn't do it. Sorry - I wanted to like them.